Only members in good standing will be granted admission to the pool. When you come to the pool, you will be asked at check-in to show the pool attendant your pool pass. Each residence was issued one free Guest Pass, which is good for ten (10) guest admissions. Additional Guest Passes will be available for purchase at the pool office. Payment for additional Guest Passes must be in the form of a check made payable to Foxfield Community Association. The pool staff cannot accept cash. If you are renting your home and wish to transfer your pool privileges to your tenant, a “Transfer of Pool Privileges Agreement” must be completed by the owner, signed by both the owner and the tenant, and submitted to FirstService Residential for the tenant to be issued a pool pass. The owner will be transferring his or her pool privileges to the tenant and will not be able to use the pool. The owner’s assessment account must be current for the tenant to use the pool. The Association will allow residents who are child care providers of children who do not live in Foxfield to purchase pool memberships for these children instead of buying passes daily. A membership fee of $35.00 must be paid for each child age 12 and under. In addition, a written request to use the pool from the parent/guardian and a statement that they hold the Association harmless in the event of accident/injury to the child are required. This type of membership is valid for pool use weekdays only until 5:00 PM. For more information, contact FirstService Residential. 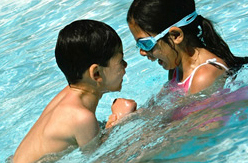 Questions about the swimming pool application process should be directed to FirstService Residential at 703-385-1133.